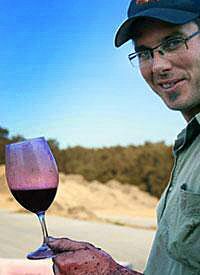 Max Allen once emailed me and suggested if I was in Canberra, I should talk with Bryan Martin, Clonakilla’s Winery Manager, saying Bryan’s a very interesting guy – softly spoken, but quirky polymath, a chef, writer, winemaker, forager and a farmer. The first Riesling he made under his own small label Ravensworth, won the award for the top wine at the International Riesling Challenge in Canberra in 2012. Bryan and Tim at work at Clonakilla. 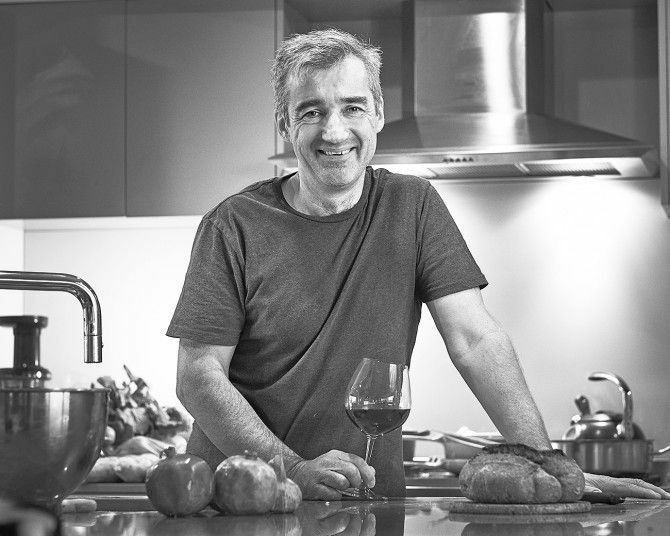 Bryan was a finalist in the 2015 Gourmet Traveller Wine Wine maker of the year, the year Stephen Pannell took out the award. 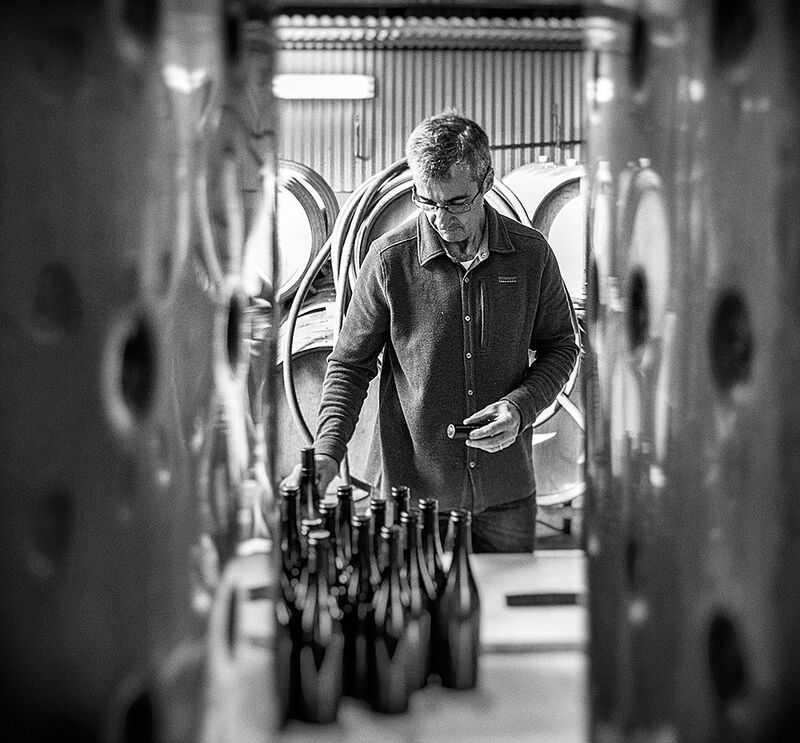 Bryan has done every vintage at Clonakilla since 2004 and been employed full time for the last ten years, he is often described as the right-hand man of Clonakilla boss Tim Kirk. Bryan gave me a bottle of his Riesling to try when I got back to McLaren Vale. Not long after I got home, Philip White called over. Whitey loves good riesling so I opened it to share. Bryan’s a very interesting guy and a bloody good winemaker and cook. Canberra, why this region ? Both my wife Jocelyn and I were in hospitality and we moved around a bit. I worked in Melbourne as a chef, then we ran a pub in Tasmania. We both had family here, so when our first child Lily was two, we came back to Canberra. Jocelyn applied for a job at the The Australian International Hotel School and got it. I was a stay at home dad for a while, then went back to work part time as a night chef at the Canberra Hyatt. You make wine, write about food, you cook an interesting mix ? I’m definitely a self-taught cook, although I did teach cooking for a time at the Hotel school. While I was there, I rang Chris Shanahan who was writing for the Canberra Times and told him, I wanted to get into the wine production industry. He gave me a short list of places where I might be able to get some experience. Back then in the 90s, it was difficult to get into the viticulture course at Charles Sturt…there was always a big queue of people because it was so popular. On the weekends, I volunteered my time and hung out at various vineyards and wineries… that got me a foot in the door and so I was accepted into the viticultural course at Charles Sturt in 1998. Your early life and why wine ? My father was involved in the bread industry, so there was a food connection. 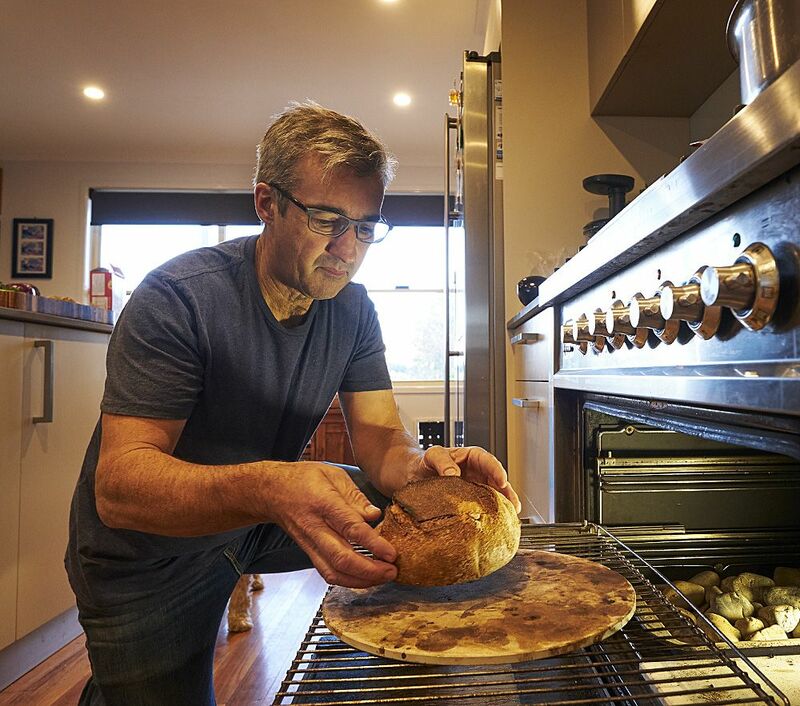 Bryan’s still baking bread at home : Photo © Milton Wordley. We moved to Canberra from Armidale in New South Wales and in 1975 my parents took me out for my 12th birthday to a restaurant called Ulysses. I was able to order anything I liked. I ordered a Poussin which I’d never heard of before and so I had the whole chicken to myself. From that point onwards, I got really into food and so mum started buying books and things. Every week , she and I would design a fairly elaborate meal. The journey started there, and I’ve been cooking since then. I actually started drinking wine quite young as well. A friend and I used to raid his father’s wine cabinet. That was back in the late 70’s I was about 17 years old. The wine was good, his father must have been quite a collector. I spent some time in England in my early twenties, where I had a job in a London wine bar and discovered French wines and then when I came back I got a job in wine retail as a trainee manager for Farmer Bros. When did you plant your first wines and why Murrumbateman ? 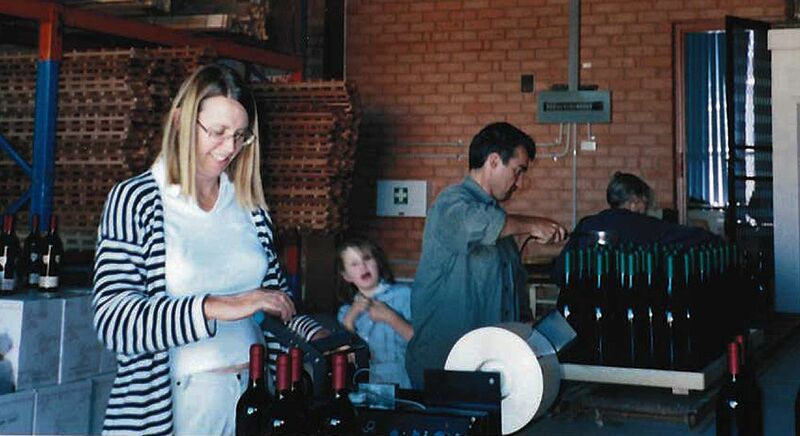 Bryan, Jocelyn and their daughter Lily bottling the first Ravensworth wine back in 2001. We bought the original block in 1999 and started planting it in 2000. It wasn’t our plan to buy, but land was quite cheap out here. The current Ravensworth Shiraz Viognier : Photo © David Reist. We planted Marsanne and Sangiovese first of all and had our first crop in 2005. The idea then was to plant Shiraz and Viognier. 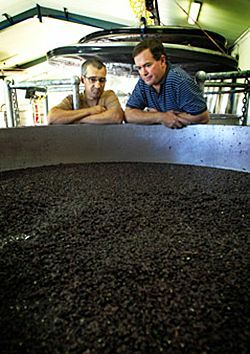 I was also involved in a contract wine making business with Rob Howell and Greg Gallagher another local. I also hooked up with Brendan Ryan, who’d put in a vineyard as a lifestyle choice, and then realised it was too much work for him. The first wine we made was the 2005 Shiraz Viognier. We also made a Marsanne and Sangiovese which are all still part of the portfolio, really the core of the brand. Around the same time that we started the vineyard, I got to know Tim at Clonakilla. Tim was doing quite revolutionary things with Shiraz. Ours is a nice little vineyard, we have all the varieties I want and we’re now organic. You have been described as Tim Kirk’s right-hand man of Clonakilla, how does that work ? 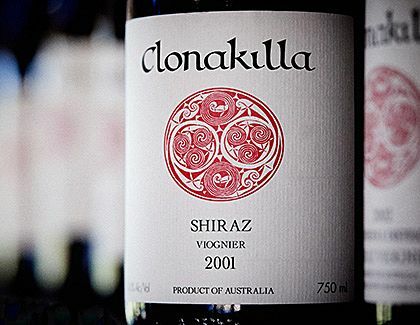 Tim’s father started Clonakilla in the early 70s. Tim moved back here about the same time that I did, in the mid 90’s. He left being a teacher in Melbourne to take over the business from his father. I got to know him quite well then because our kids were all about the same ages. By 2003, I’d finished my second degree of at Charles Sturt, wine science and Tim asked me if I wanted to come up and work at Clonakilla. It was a good opportunity, there weren’t any full-time winemaking jobs, so from 2004, I worked as his assistant for a couple of years. Tim and Bryan at the Clonakilla tasting bench : Photo © David Reist. My role here now is as the Winery Manager. 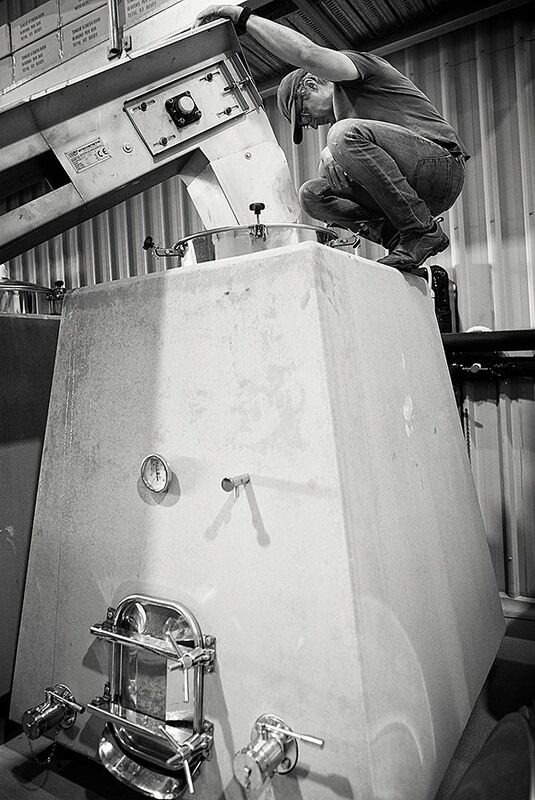 I have 4 or 5 people working with me… I’m involved in the everyday winemaking, but the final blend is Tim’s. Clonakilla ‘Shiraz Viognier’ is regularly in the ‘Exceptional’ Category of the Langtons Classification list : Photo © David Reist. It is great to be involved with the most well known brand in the region. We would be in the top ten in Australia. When I started here we’d probably make a couple of thousand cases a year, we are more like 20,000 cases now with a lot of different lines, so the winery is quite a busy place now. 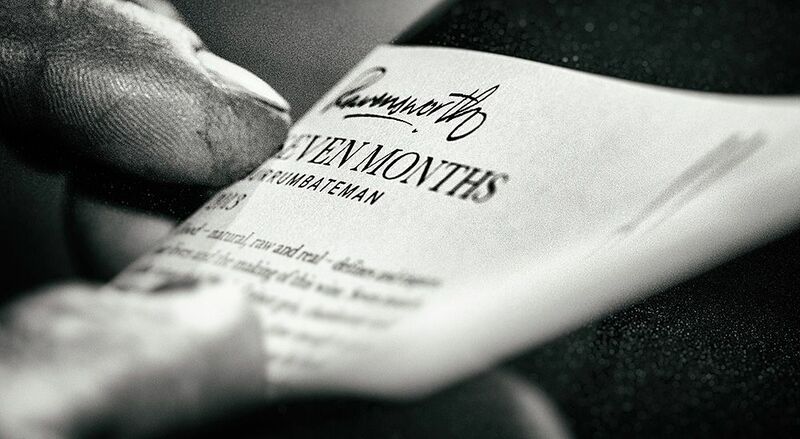 Your own label, Ravensworth …what style wines are you making ? I try to model all of my wines on a style by not using any additives, I use the skins a lot and I’m not afraid of textured wines. We try and have different techniques for all of the different styles of wine. I’m probably better known for Italian varieties than the French varieties. Bryan on one of his eggs at Clonakilla : Photo © David Reist. We’ve got essentially about 18 different wines at the moment. I’m mostly using Ceramic Eggs for my Riesling and lots of other stone and wood for the range. The brand’s based on fruit from the Canberra region however I also get fruit from Tumbarumba and Hilltops and even down lower in Gundagai. Your Riesling had done quite well in a couple of shows. We only started making it in 2012. That year was an awful year, we lost half the crop, got hit by a hail storm and then we had eight inches of rain. The vines were in really bad shape, I think we paid $1500 tonne to have it picked because they had to pick through the bunches. It was such a small batch so we did a different technique in the winery. When I’d made it, I was thinking this is going to be awful. There were only about 150 cases, it was really high acid and so I ended up leaving it quite sweet. We entered it into the International Riesling Challenge in Canberra that year and it won technically the ‘Best Riesling in the World’. Judging the International Riesling Challenge : Photo © Chris Holly. I think it was because they probably didn’t know what it was, most of the Australian wines are dry Rieslings, this was more in the German style. 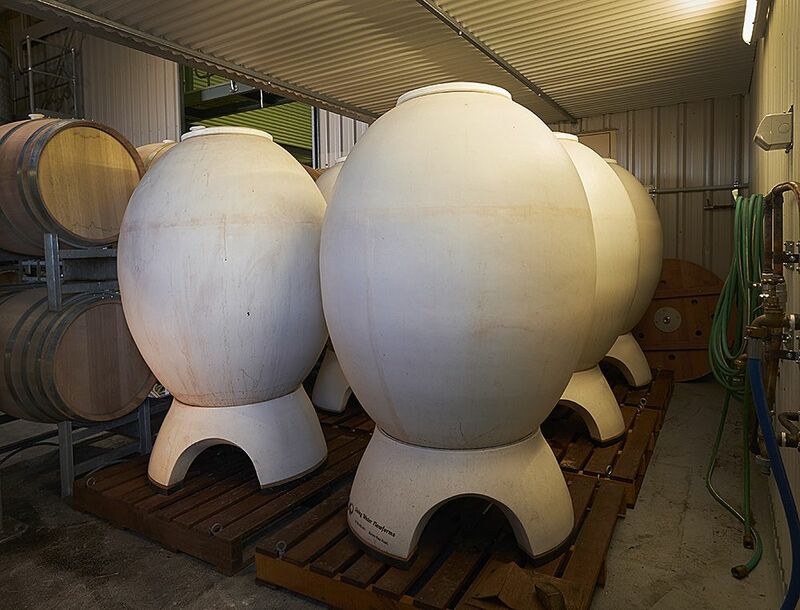 Ravensworth Ceramic Eggs at Clonakilla : Photo © Milton Wordley. So that sort of, thrust us into being Riesling producers. The next year, 2013, was a really good year and we made a bit more and took out the top prize at the local regional show with a dryer style of wine….then it got a trophy at ‘The National Show’. 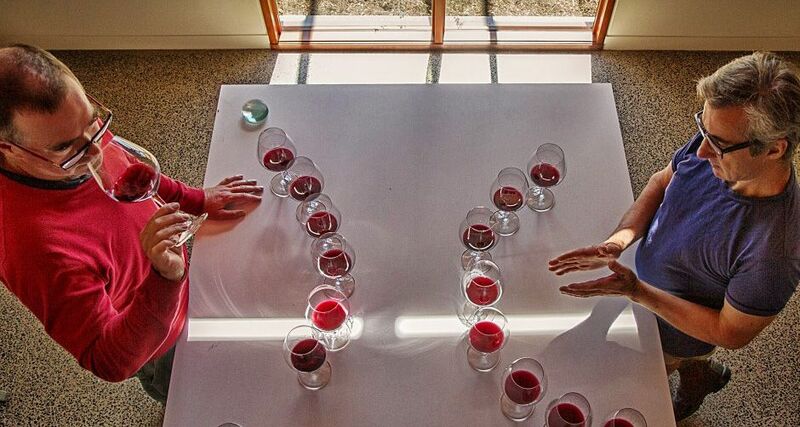 After this the 2014 was judged champion wine at the NSW Small Winemakers Wine Show. I’d actually made bugger all Riesling, but all of sudden people were thinking of us as being Riesling producers. Your wine ‘Seven Months’ ? I made my first sort of natural wine in 2013… I think it was probably a cynical response to what was happening. I’d tried one or two that were okay, then one night I cooked a dinner at my place for a group who I’d done the Len Evans tutorial with. 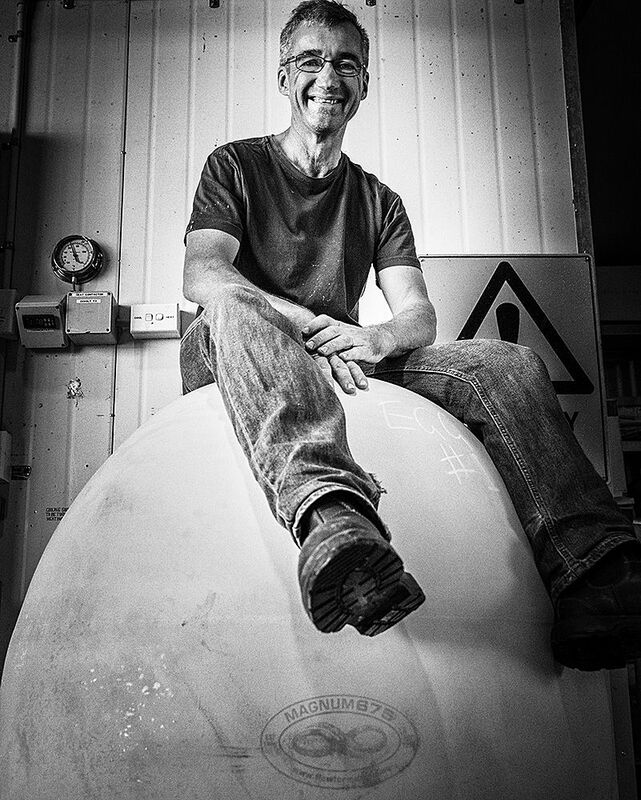 Bryan bottling ‘SevenMonths’ : Photo © David Reist. We try to get together once-a-year. Mike Bennie supplied a Gravner, a skin-contact white wine from Italy. That wine really changed my idea on wine. I decided I was going to try and make one. I had no idea how to do it and so we just filled a pressure vessel with grapes, covered it with juice and locked it up. A bit like making a wine the way the Romans would have, by leaving it alone until it tasted good. So we just did that …I just left it alone …every now and then, we’d have a look. Mostly it smelt awful, so I just pushed it aside and thought, well that didn’t work. Then later that year I went to the tank and emptied it out, let it settle and it just was the most amazing, complex, fresh as a daisy wine, which is the style we were basically trying to make. We bottled it and called it Seven Months, because that’s how long it was on skins for. One of the first people that actually tried that wine was the head Sommelier from Noma. Hand labelling ‘Seven Months’ : Photo © David Reist. Absolutely, there’s no question there. When I came to choose a variety to plant first, Sangiovese was an easy choice. 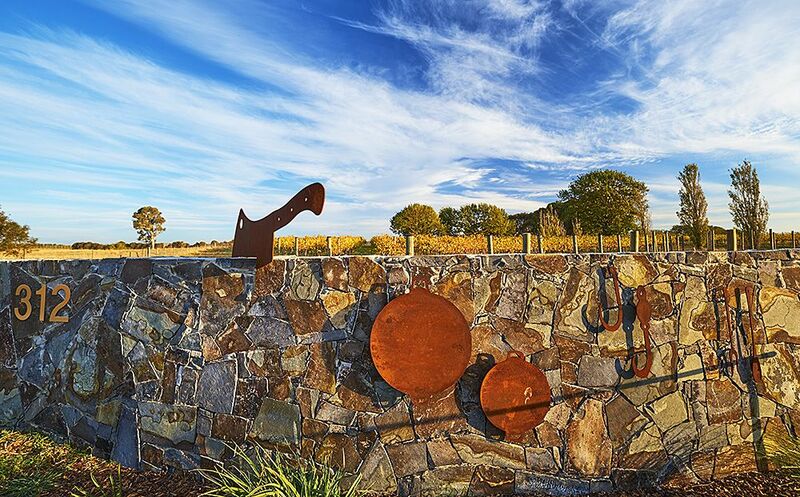 Ravensworth vineyards high up in Murrumbateman in the NSW southern tablelands : Photo © Milton Wordley. Early on we were picking in May but now we’re picking in March. I think we’re actually making better wine here now with climate change than we were before. Sustainability takes an awful lot of time. Sometimes that idea of having that whole farm thing sustainable is something I think we might do one day. But it takes a lot more time than you ever could imagine. 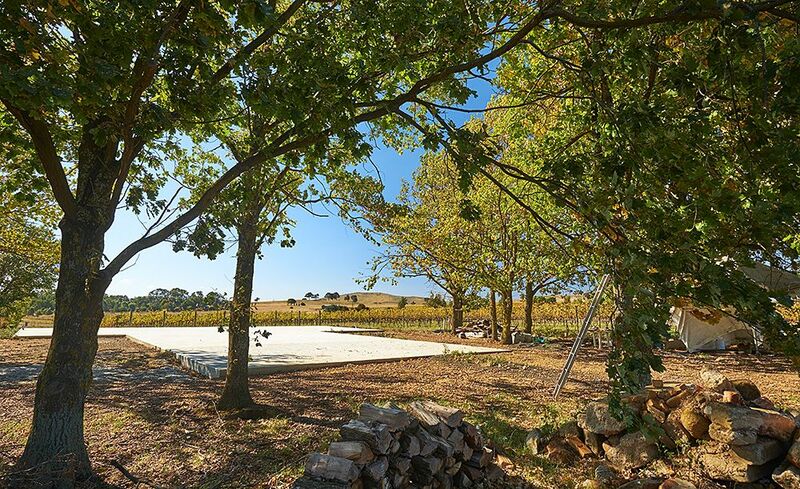 The future site of the Ravensworth winery and possible cellar door : Photo © Milton Wordley. Your own cellar door ? We might when we finish our own new cellar. It will probably be along the lines of an “appointment only” type of thing. I’ve noticed that people, people are always trying to find out where we are. We get lots of phone calls. People know us and know that we have a pretty attractive range of wines and that they are hard to get. I guess, that’s something that I learnt from Tim when I started here. The entrance to Ravensworth : Photo © Milton Wordley. What’s the back label to your book ‘Tongue and Cheek’ ? The Canberra Times rang me in 2005 and asked if I’d like to do restaurant reviews. I have no idea how or why they found me, maybe the connection with the Hotel school. 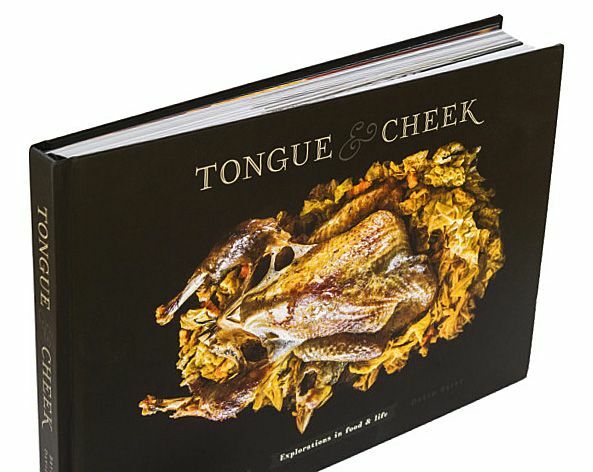 ‘Tongue and Cheek‘ the book : Photo © David Reist. Then we started a column on paddock to plate eating, it was all about a lifestyle as a hunter and gatherer, raising a family on a farm, getting old. I did it for 8 years 1,000 words a week. Eventually I just gave it up because the work at Clonakilla and the Ravenswood brand got in the way… it just became too hard. I’ve been chased out of restaurants a couple of times, so in the end I thought, oh, stuff it. When I gave it up I missed it, it was a lot of fun and the book is based on the good part of one year. I love to cook and still cook most weeks at Clonakilla. 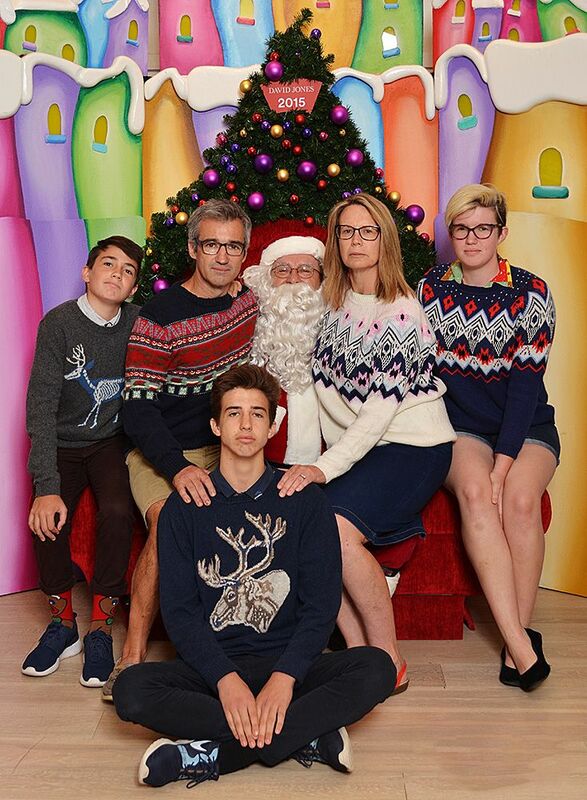 My wife is over in Singapore working at the moment and my other two kids live in Melbourne at the university. So, it’s just me and my 15 year old, alone here for weeks. This week we’re going through a whole week of different burgers, one every night…. I just love that sort of thing. Steak tartare and accompanying ingredients from the book ‘ Tongue and Cheek’ : Photo © David Reist. When I’m doing a tasting, people always ask me about that. Its pretty easy for me to think about matching food with wine. 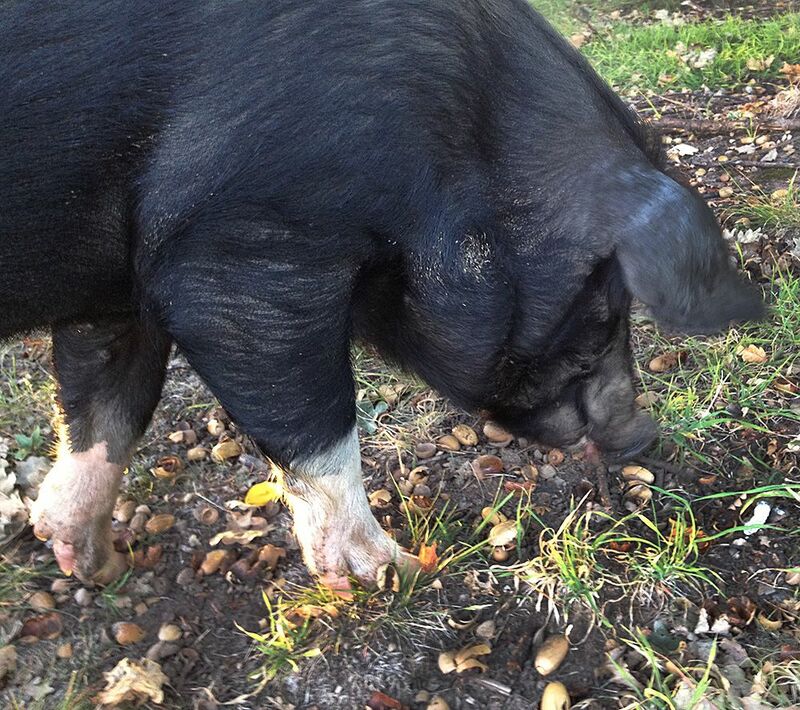 Bryan’s pig Kevin before he became proscuitto. I guess, I’m always thinking about what will go with the weight in the wine and the textures, where will this sit in the spectrum ? The wine we make is food wine, it’s a medium weight wine … we don’t make big heavy wines. It’s probably the reason why I have so many wines in my brand. I cook more than most people, and I’m always trying different things, new techniques. It’s the same with winemaking. How do you sell your wine ? We sell it all through direct thru our website and we have a small distributor called Imbibo. We were one of their first customers. Cathy Willcock runs it, she has other small producers like, Gary Mills from Jamsheed, Jasper from Commune of Buttons, Ricky from Two Tonne Tasmania, all whose wines I really like. Our Sangiovese is on pour in lots of places, and they roar through it. Adelaide’s become quite a good wine market for us. It’s a small market for others I know, but we sell a lot of wine down there. Might be because we make a lot of varieties. Seems like Adelaide people like to try different wines. Our only problem is we always run out of wine. I love this industry, the wine industry is just fabulous. Tim and I often say that we’re so lucky to be in it, because this is our life. 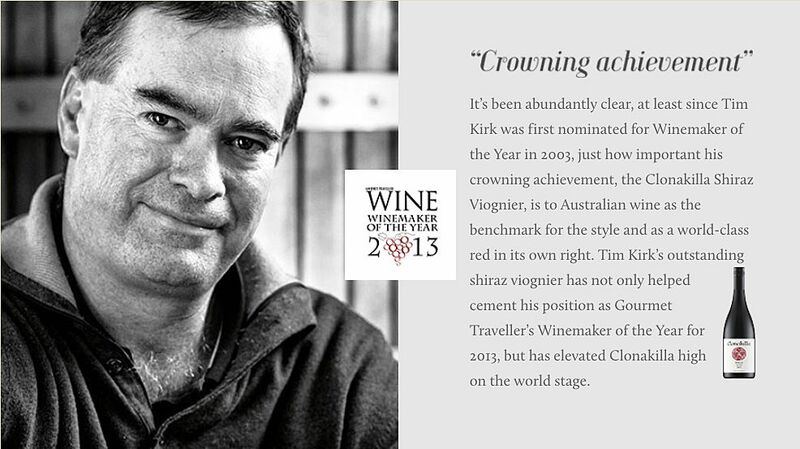 Tim Kirk Gourmet Wine’s ‘Wine Maker of the Year’ in 2013 : Photo © David Reist. It’s challenging, each vintage is always a guess, especially on the farming side of things. Bryan exploring the top of a pyramid at Clonakilla : Photo © David Reist. I love the idea of exploring the vintage. I can’t say I have had bad vintages because most varieties need different things. Shiraz needs different things to Sangiovese. We’re lucky because this is a really good area to grow. I’m surprised there’s not more interest in the whole Canberra region. There is a movement to Tasmania but this area has some really positive things, like the sunshine and rainfall. We’re the last place to go into drought in New South Wales here. The Martin home amongst the Ravensworth vineyards high up in Murrumbateman in the NSW southern tablelands : Photo © Milton Wordley.